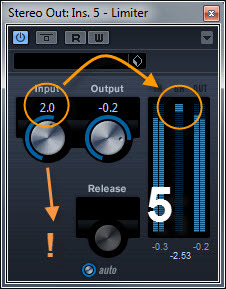 This short Tutorial is about "MASTERING" within Cubase and with its effects. What happens during the process of "mastering"? Which jobs or tasks have to be done between the "not -" and the "mastered piece"? MASTERING doesn't mean: Let's make a piece as loud as possible. 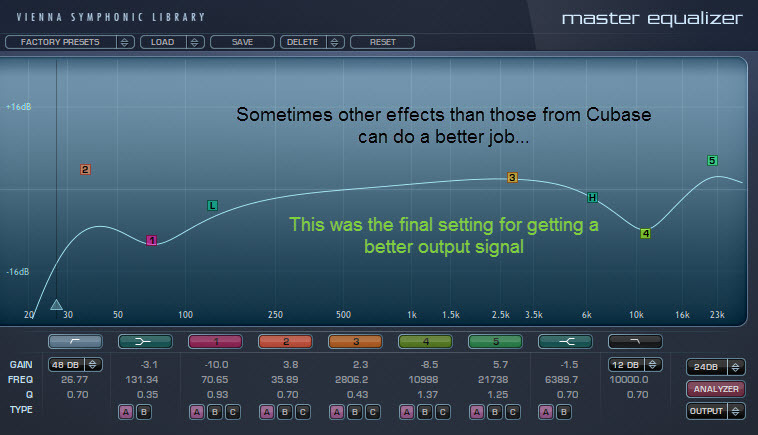 If that would be so you could take a good limiter or maximizer - and here we go. So what are the steps for producing a final piece which doesn't lost its dynamics, but nevertheless, which got loudness and some punchy "crisp"? This is a possible "Mastering Chain". 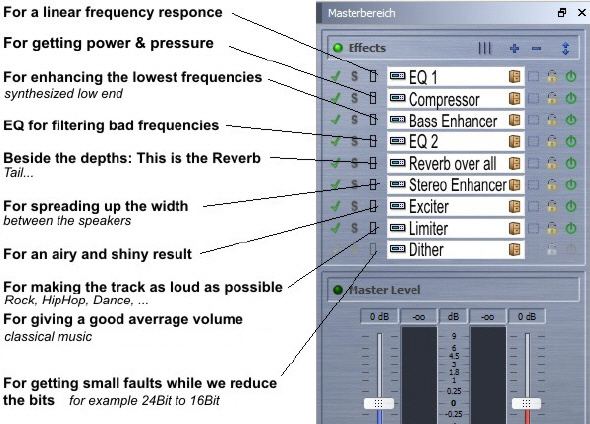 Nevertheless, take into account that some mastering processes do not need a lot of effects. a possible "Chain of Mastering"
... above the highest peaks for doing all the next steps. make sure that you get low levels from all the channels. Scan the frequency range as you can see (image on the right). Maybe you can find some frequencies which will get an extreme resonance. But attention: Make sure that it isn't a xth-harmony of a current tone of the music. ... the bad frequencies (3, 2 in our example) and enhance perhaps the low and high frequencies (loudness). 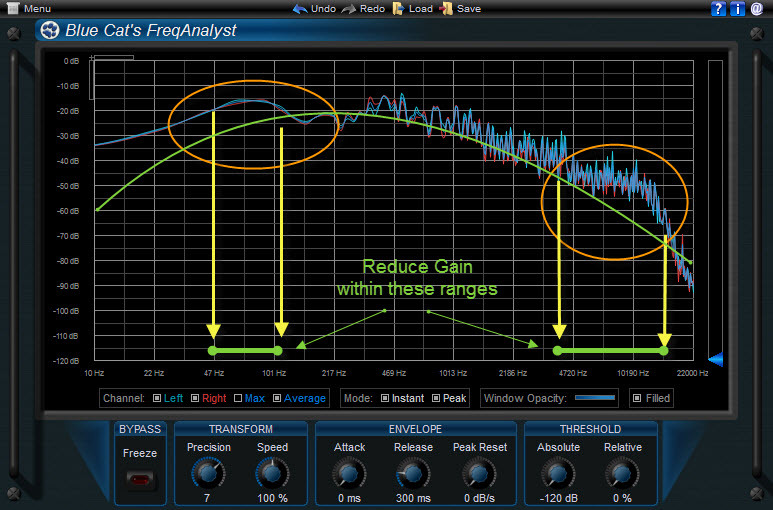 Install an EQ for cutting frequencies below 25Hz with a high pass filter (not shown with the current EQ on the image). So you remove all the "high energy waves", rumbles and the DC faults. ...or take the parameters from my setup "neutral as possible" (see the image). 5. Add a "reverb over all"
Maybe you used Reverence (or another Convolution Reverb) within the mix for getting several depths. 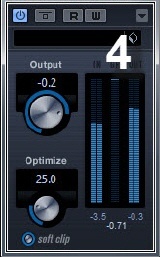 If yes, take here a Randomizing Algorithmic Reverb as we get with Roomworks for example. Here are some test of other good sounding reverbs for this case. 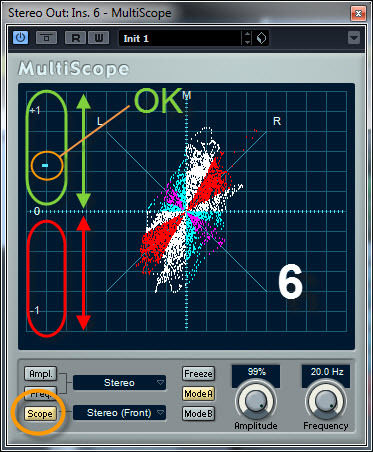 Check the spectrum for example with the free "Blue Cat's FreqAnalyst"
Observe the diagram whether it has deviations from the ideal curve (green) or not. 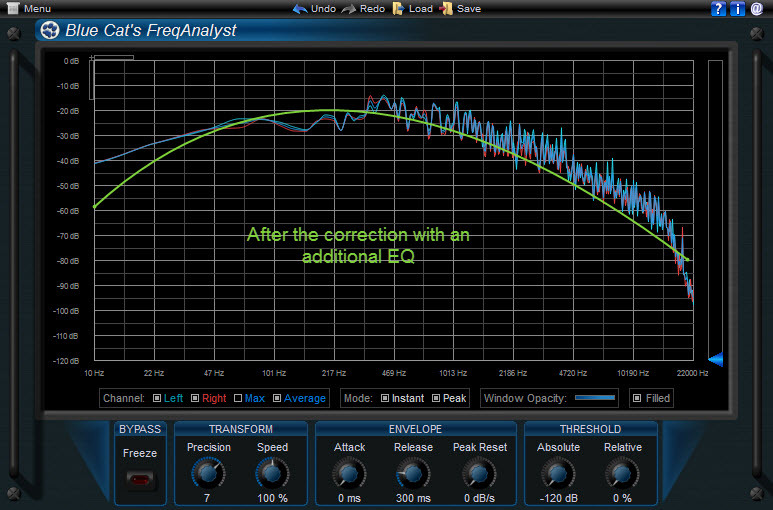 We should use now another EQ for decrease the certain frequency ranges for a nice final output signal. Sometimes the effects of other companies can do a job better than the effects of Cubase. This here is a matter for another EQ. We should select a very good EQ and if possible one with a "Linear-Phase". When we did a good job we will reach a curve as shown below. Of course we always can and should use our ears as well. With classical instruments orchestras we should get curves as the one we have here. I don't have really experiences with Rock, Hip Hop, Dance and other styles of music. You can get more width with the stereo signal. But attention: Check always the correlation within the "Multiscope" (9.). The marker should be always between 0 (zero) and +1. For getting even more punch can insert a "Maximizer" here. Some music needs the maximum power we can get. Unfortunately, you lose the whole dynamic this way. So it is you decision "loud or more dynamic range". It depends on the music style. For cutting the highest peaks we use a limiter. Make sure that the limiter only has to limit some loud parts of your piece. 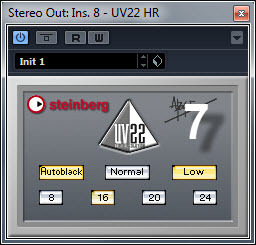 Set the "Output" to -0.2dB! The output signal doesn't reach the absolute 0dB end this way. The reason is: Some old CD-Players can't play the 0dB without distortion. Check the signals - specially the value "Correlation". The marker should be mainly between 0 and +1. This means: Your final Audio-File will be "mono-compatible". If the signal most of the time is between -1 and 0 switch the phase "on" (top of the channel) and observe the correlation again. A better solution is to search the "source" of the bad phase. 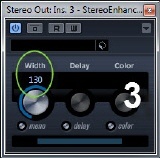 Often we have audio effects which are producing those bad "phases" such as reverb, chorus, stereo widener, etc. When you are going to reduce the signal now from 24 Bit to 16 Bit (CD) or from even higher Bit-resolutions down to 16Bit use the dither effect. Read >>>here more about dithering. Even if we already use 16Bit audio-files for example Cubase and other DAWs are calculating all our effects with a solution of 32Bit (or more). So use a Dither for the really final export in any case. 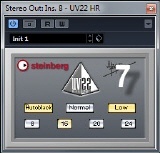 Also: Often Effects add some noise (vintage simulation). Then a Dither is not really necessary! The order of the PlugIns isn't fix. ... and listen for further examples. 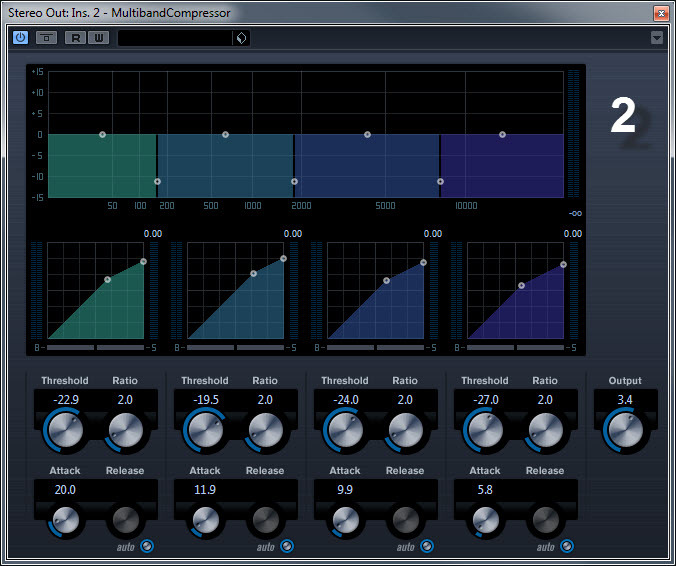 But some good mastering effects can easily cost the price of Cubase itself.